Sandrine is a proud graduate of Lycee Notre Dame de Citeaux and was selected as a representative of Nike Girl Hub in Rwanda, where she became a valuable member of the research team. 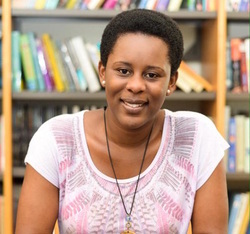 Sandrine has researched the barriers to education for girls in Rwanda and has been chosen to present her findings at two recent Girl Hub Conferences. She graduated from Muhlenberg College in 2018 with a degree in public health and international studies. Her goal is to empower girls and women in Africa through Health and Education Policy. At Muhlenberg, Sandrine was an active member of Peer Health Advocates, where she collaborated with others to organize and conduct events that encouraged healthy decisions about nutrition, sexual health, and wellness on campus. She was also a member of the International Student Association and the French Club. In 2016, Sandrine spent her summer interning with the World Health Organization (WHO) in Rwanda. In 2017, Sandrine excelled at an internship with the Peer Health Advocates at Muhlenberg. Her role was to create programs that promote health and wellness on campus by designing evidence based interventions. This September, Sandrine will be starting her post graduate degree in Global Health Policy at the University of Edinburgh in Scotland.